Create win-win authority relationships! Explore practical and effective ways to teach students responsible behavior with boundaries instead of rules, and with positive outcomes rather than penalties. Discover how to construct and utilize win-win discipline strategies to encourage cooperation, responsibility and self-management, to resolve and prevent problems, and to establish a foundation of mutual trust, consideration and respect. Practical, effective techniques to maintain authority while avoiding frustrating power struggles. Using preventative, win-win techniques to minimize conflict and maximize on-task behavior. Utilizing positive boundaries rather than negative consequences to promote student self-control. Teaching students responsible behavior through the use of choices and negotiation. Implementing strategies to promote academic safety by eliminating fear of failure. Effectively using recognition and encouragement to promote learning and responsible behavior. 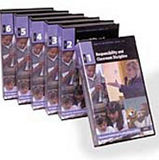 Part of the Responsibility, Respect and Relationship series, this package includes 6 DVDs, approx. 30 minutes each, $299.95. Please note: This product is now produced exclusively on DVD, the packaging may appear different than in the image above. Win-win discipline strategies to teach students responsible behavior with boundaries instead of rules, and with positive outcomes rather than penalties. 6 DVDs in set. Responsibility, Respect & Relationships: The complete program includes all 13 DVDs featuring Dr. Bluestein, 2 bonus DVDs featuring Dr. William Glasser, plus facilitator materials, $799.95.